In addition, the wealth of essential information on mouse laboratory strains, mouse housing and breeding, surgical procedures, assisted reproduction, handling of embryos, and micromanipulation setups has been entirely updated. 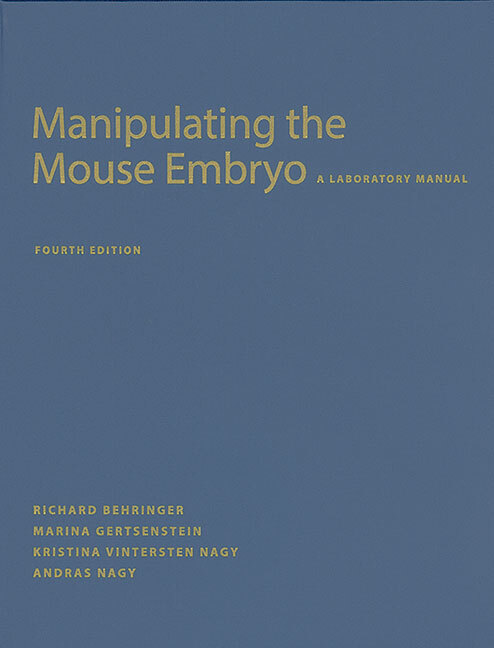 The first edition of Manipulating the Mouse Embryo appeared in 1986 as an outgrowth of Cold Spring Harbor Laboratory courses on the molecular embryology of the mouse held in the early 1980s, and authors of the first two editions included Brigid Hogan, Rosa Beddington, Frank Costantini, and Liz Lacy. The field's technological sophistication has grown exponentially since then, but the manual remains the essential practical and theoretical guide for all students, lab technicians, and investigators who work with mice. I have the third edition. Why should I buy the fourth edition? The new technologies regarding induced pluripotent stem cells and RNA injection and CRISPR technology are changing the field and opening up new avenues of investigation. The protocols for these as well as other up-to-the minute techniques in the fourth edition are by the leading proponents in the field and offer clear step-by-step guidance with copious illustrations. To whom is this edition addressed—the neophyte or the experienced investigator? Both groups can benefit from this manual. For the neophyte, the summary of mouse development and the how-to's of setting up a working laboratory are an invaluable introduction to the field. For the experienced investigator, the detailed protocols of new techniques in the field, with extensive troubleshooting and over-the-shoulder advice, allow easy integration of these techniques into a laboratory's research objectives. Many of the protocols available on the Web are perfectly good, but there are many that are not. Reagents are expensive and deadlines are tight. CSHL Press manuals provide protocols that have been formulated and tested in the labs of leading investigators in the field. They are reliable and they work. And they include the context and troubleshooting information that many online protocols do not have. In the case of the protocols in this manual, there is a bit of "art" required in the performance of these protocols. But the experience and advice of these authors provides all of the information needed to achieve success in the lab.